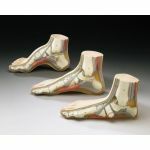 This is an anatomical model of exceptional quality and design from Germany. 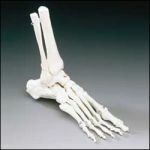 A detailed model of the right foot and ankle with ligamentous apparatus. Ideal for demonstrating rotary movements as well as bending and extension. Life-size. Includes teaching manual. Does not dissect. Model is removable from stand. Model size: 7" x 10 1/2" x 12 1/2". Suitable for Orthopedic Surgery, general anatomical study, training for surgical dissection, sports medicine, or for patient education/demonstration of procedures. Quantity discount available. Brand new. In original factory packaging. We also offer other Fully Functional SSMtm branded orthopedic bone/joint models including Fully Functional Knee, Hip, Hand/Wrist, Elbow, and Shoulder. Most with full range of joint motion and detachable ligaments.